1. Place left heel near ball of right foot as you bend right knee and bring hands back-to-back in front of body. 2. Straighten right knee until it is only slightly bent as you turn fingertips toward body, then upward and forward in a circular motion until palms face upward in front of chest and fingertips point forward with little fingers touching each other. 3. 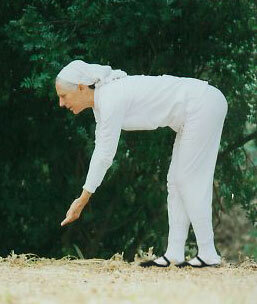 Bend your knees and begin to bend forward from the waist as you continue circling your fingertips downward and then inward again, turning palms toward each other and then toward your body so that fingers continue to touch. 4. Staying bent forward so your back is nearly parallel to the ground, straighten knees slightly as you shift your weight to left foot and continue circling fingertips inward, then upward, then forward, and finally diagonally downward toward the earth with little fingers touching each other and palms open toward the front. 5. Form a MEM with your head lifted and face forward. 6. Bend your knees and press your weight into the earth with both feet as you begin to raise your back and lift your arms upward in an arc. 7. As you straighten knees slightly, shift your weight to right foot; when arms reach shoulder height, curl fingertips toward body so that backs of fingers touch. 8. Bend right knee as you continue circling fingertips inward and then downward in front of upper chest. 9. Bring left foot back next to right foot as you straighten right knee until it is only slightly bent and balance weight on both feet evenly as you lower fingertips toward the earth with backs of fingers touching until hands separate about thigh height; then move palms in a wavelike motion first outward, then inward, then forward, and finally toward the back so hands come to rest at your sides with fingertips pointing toward the earth. 10. Repeat full sequence starting with opposite foot; then repeat sequence eight more times on each side. As each new hand movement makes its distinct shape. As backs of hands touch and one foot extends slightly. Then tipping over with the fullness of gratitude. And allow the gently arching back to find its curve. Lowered palms open, offering a moment within Mem. And lift them upward and inward to the Self. In a mikvah of wholeness.